This article is outdated. Click here for the replacement. Sinus Jevi fan heaters are characterized mainly by their quality, both in used materials and design. A heat efficiency of 100% from the supplied energy is being achieved without odor, noise, refill, loss or malfunctions. Fan heaters and hot-air blowers have a large air capacity. Therefore large spaces can be heated at the same time. They supply 100% dry and clean air without flue gases and are therefore harmless to humans and animals also in unventilated spaces. Since there is no open fire they are absolutely fire proof and require little maintenance. The TVI is a mobile heater and fit with a black bracket. Wall mounting is also possible due to the wall bracket which is included. The TVI has a built-in control thermostat, can be switched in several steps and is spray proof IPX4. 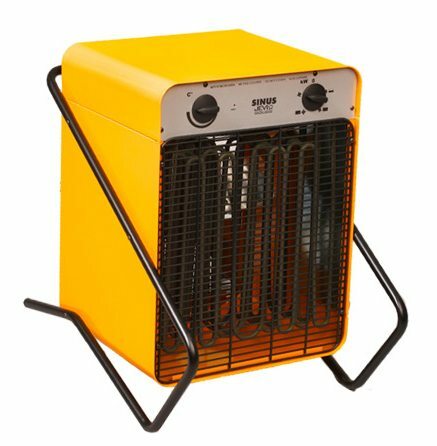 Sinus Jevi electrical heaters are manufactured according IEC standards and consist of a galvanized steel casing which is spray proof IPX4 and has a durable layer of yellow epoxy paint. This provides a double protection against rust. The heating elements have a stainless steel sheath.